Heat oven to 425°F. Spray large cookie sheet with Crisco® Original No-Stick Cooking Spray. In 10-inch skillet, cook turkey in oil over medium heat 5 to 7 minutes, stirring frequently, or until turkey is no longer pink. In large bowl, combine cooked turkey, mandarin oranges, dried cranberries, roasted peppers, olives, garlic powder, crushed red pepper and jerk seasoning; mix well. Remove turkey from skillet; set aside. To warm skillet, add vinegar and reserved mandarin orange liquid; bring to a boil over medium heat. Stir in apricot fruit spread until blended. Add turkey mixture to skillet; mix well. Bring to a boil over medium-high heat. Reduce heat; simmer 10 to 15 minutes or until liquid is absorbed. Stir in 2 tablespoons of the cilantro. Unroll pizza crust dough on cookie sheet; press dough into 13x10-inch rectangle. Bake 6 to 10 minutes or until edges are light brown. Remove from oven. Sprinkle crust with Parmesan cheese. Top with turkey mixture. 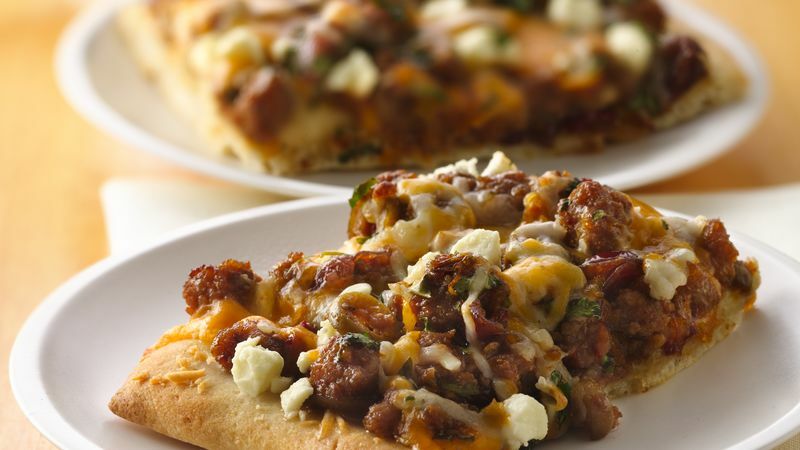 Top with mozzarella, Cheddar and feta cheeses; sprinkle with remaining 2 tablespoons cilantro. Bake 10 to 14 minutes or until crust is golden brown and cheeses are melted.